Electric cars, like solar power, have been a “feel good” technology that for decades couldn’t compete with the more common and environmentally destructive fossil fuel alternatives without the aid of subsidies. That’s all going to end. The economics of on-demand transportation will fiscally favor electric vehicles and if gas prices rise back up (I’m writing this in mid-2015) to the level they’ve been at for the past 5 or 10 years then electric vehicles will be massively more advantageous. It’s meaningless to discuss the cost competitiveness of gas vs. electric power without first understanding the relationship between a gallon of gasoline and an eGallon, which is the electrical energy equivalent of a gallon of gas. 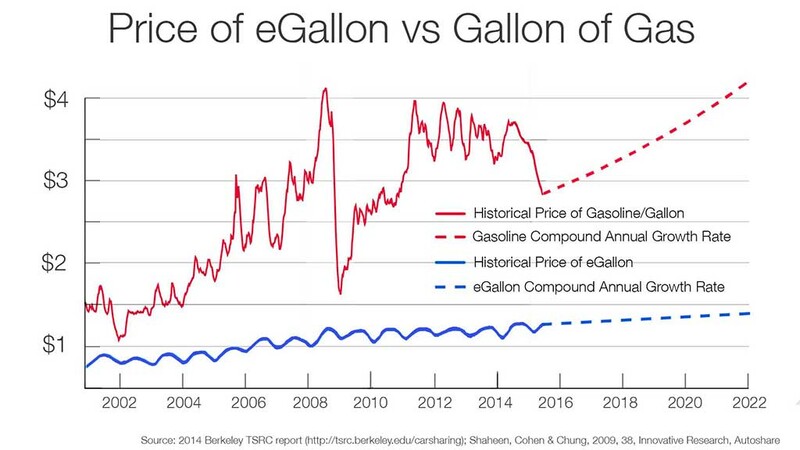 See this slide that describes the historical relationship between the price of a gallon of gasoline and the price of an eGallon. What we learn from this is that the price of electricity is extremely stable and predictable, and it’s even seasonably predictable. The price of gas, however, is completely unpredictable. It varies roughly between 1.5x and 4x the price of electricity on national average. This means that it doesn’t really make sense to analyze the cost effectiveness of electric vehicles in terms of just one fixed ratio of the price of electricity to the price of gas. 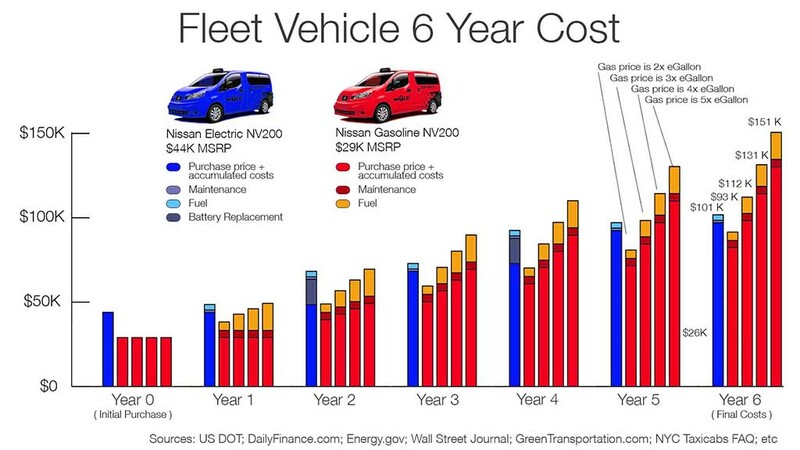 In light of this, I’ve analyzed the economics of a gasoline vs. electric fleet vehicle in this slide at several different multiples of how much gas costs relative to electricity. Even with having to replace the batteries in the electric vehicles every 150K miles, they still have cheaper running costs than gasoline vehicles at any multiple of gas prices more than about 2x the price of electricity. And don’t forget that gasoline engines are an ultra-mature technology that has benefitted from over a century of optimization. Electric vehicles are a very immature technology that have lots of room for improvement and growth. I would call the Tesla Model S, BMW i3 and any other current generation purpose-built electric vehicle version 1.0 of electric vehicle technology. I consider the Tesla Roadster, Nissan Leaf and any other EV that’s a derivative of a gasoline design the beta release of electric technology and I consider the GM EV-1 to be more the prototype phase of electric vehicle technology. I mentioned that this analysis is budgeting for the replacement of the batteries every 150K miles (roughly every two years). The more we learn about the longevity of Tesla’s Roadster and Model S batteries, however, the more we learn that that estimate might be conservative and perhaps it might not be necessary to change the batteries that often, which means the electric advantage would be even greater. This page describes an electric vehicle’s fiscal competitiveness with gasoline technology, but keep in mind that the thrust of this web page is describing how single occupant vehicles are going to become the dominant automotive architecture in the world in the next twenty years. These vehicles will completely disrupt the economics of transportation in the future, as described in the next section.